Klibansky places a 13 meter tall version of hist iconic sculpture "Self Portrait of a Dreamer" in the center of the pond on the Museum Square in Amsterdam. Situated in the center of the Museum Quarter in the Dutch capital Amsterdam, surrounded by the Stedelijk Museum, Rijks Museum and Van Gogh Museum, lies the pond in which a 13 meter tall version of Joseph Klibansky's sculpture "Self Portrait of a Dreamer" looks over the 13 million tourists that visit the spot anually. On the 26th of June 2018 the sculpture was proudly inaugurated by the chairman of the city district Amsterdam Zuid (south) Sebastiaan Capel. 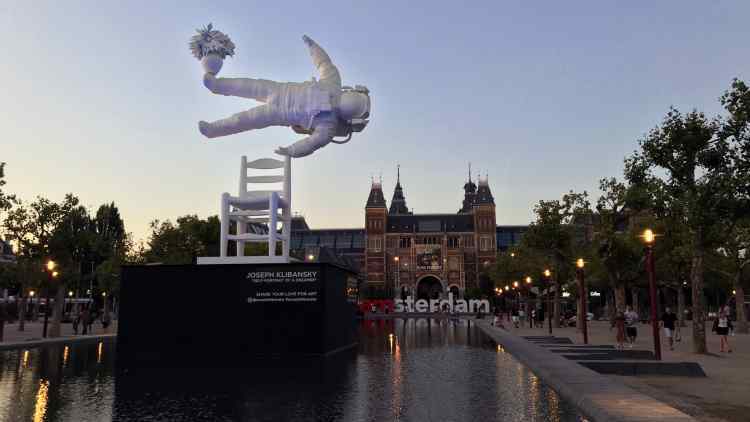 The Amsterdam Zuid area has a long tradition of open-air sculptures and site-specific installations. Every two years the city hosts the ARTZUID event, a sculpture route that presents more than 60 outdoor installations placed in the open areas of the route stretching 2.5 km. Before Klibansky, many other great artists have been exhibited on the Museum Square, like Richard Serra, John Chamberlain, KAWS, Richard Jackson and Miquel Barceló. Amsterdam Zuid is becoming a big center of interest for art lovers the world over. The idea is to publicly show artworks to the general public, but also invite people to visit and explore the south of the Dutch capital. Joseph Klibansky’s Dreamer will be exhibited on the square until the 28th of August after wich it will continue its gerny to another location. As both an Astronaut and a Dreamer, this sculpture does not have its own dwellings but it has been floating from one city to another during the last two years making millions of people dream as children again. Keep your eyes open, in the near future you could see the Dreamer floating over a hill in Switzerland, in the busy streets of London or in a renaissance square of Florence! The nomadic Astronaut of Joseph Klibansky will keep moving from city to city thanks to the collaboration with some of the most influent Art Institutions recognized worldwide.